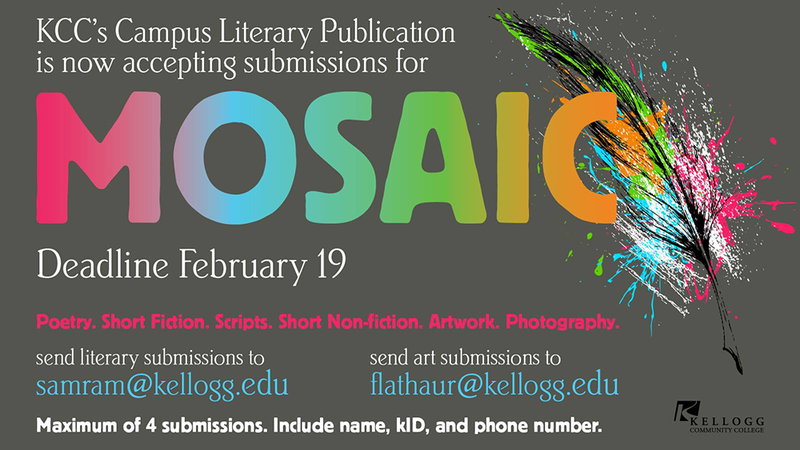 Kellogg Community College is accepting submissions for consideration for publication in Mosaic, the college’s student literary journal, through Friday, Feb. 19. Written/literary submissions should by emailed to KCC professor Matt Samra at samram@kellogg.edu, while art/visual submissions should be emailed to KCC professor Ryan Flathau at flathaur@kellogg.edu. All submissions must include the submitting student’s name, K-ID number and phone number.